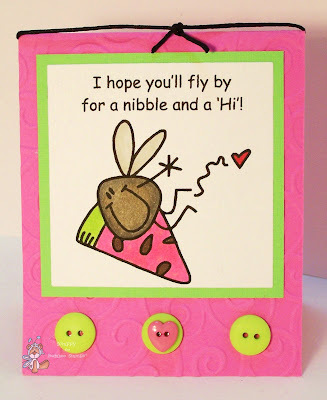 Today is New Release day at Bugaboo Stamps, and I am super excited to share the first of two cards I made featuring a digi from the Fruit Fly line! This fun digi is just one of a brand new set in the BUG SHOP. Head over to check out the whole collection! Very cute card. Fabulous coloring. Great buttons. Thanks for joining us at Clear It Out. Really cute, love the colours! Thanks for joining us at CES Challenge, good luck! Cute. Thank you for joining us at DDSB. Thanks for joining us at Lollipop Crafts and CCC and good luck!